The Rev. King, motivated by his Christian faith, stood, marched, and spoke to advance civil rights. 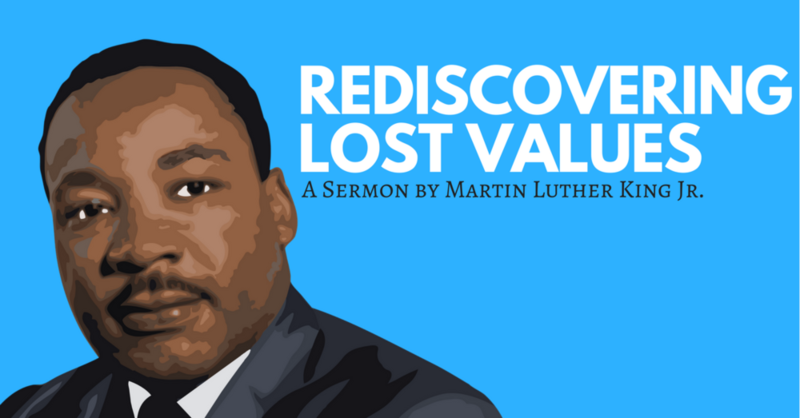 While many people know about his "I Have a Dream..." speech, few have heard the inspiring sermon he delivered in Detroit in 1954 - "Rediscovering Lost Values." "My friends, all I'm trying to say is that if we are to go forward today, we've got to go back and rediscover some mighty precious values that we've left behind. That's the only way that we would be able to make of our world a better world, and to make of this world what God wants it to be and the real purpose and meaning of it. The only way we can do it is to go back and rediscover some mighty precious values that we've left behind." To read the sermon, click here. For a more powerful experience, read the printed text while listening to Rev. King deliver his 1954 message by clicking here or watching below. "We hold these truths to be self-evident: that all men are created equal; that they are endowed by their Creator with certain unalienable rights; that among these are life, liberty, and the pursuit of happiness; that to secure these rights, governments are instituted among men, deriving their just powers from the consent of the governed; that whenever any form of government becomes destructive of these ends, it is the right of the people to alter or to abolish it, and to institute new government laying its foundation on such principles…"
No king or emperor, no president or congress, no court or crowd gives us our rights. They come from God himself and are unalienable. And the Founders built America's "foundation on such principles." 2. Abraham Lincoln explained why being "one Nation under God" is important. "Fourscore and seven years ago our fathers brought forth upon this continent a new nation, conceived in liberty, and dedicated to the proposition that all men are created equal. Now we are in a great civil war, testing whether that nation, or any nation so conceived and so dedicated can long endure." 3. Martin Luther King, Jr. explained why being “one Nation under God” is important. "I have a dream that one day this nation will rise up and live out the true meaning of its creed: 'We hold these truths to be self-evident: that all men are created equal.'" In every century of American history, arguably the most significant document or speech of that century references the rights of Americans being derived from our Creator: Jefferson's Declaration of Independence in the 18th century, Lincoln's Gettysburg Address in the 19th century, and Martin Luther King, Jr.'s "I have a dream" speech in the 20th century. 4. It doesn't matter that the phrase "under God" was added to the Pledge in the 1950s. Some people argue that "under God" was not in the original Pledge and was inserted over 50 years later. But, that only proves it took over 50 years to get it right! 5. The phrase "under God" does not make the Pledge a prayer. Some people argue that "under God" is a form of prayer, and thus it is unconstitutional to have schoolchildren recite it. However, a careful reading of the Pledge of Allegiance reveals that we are not pledging allegiance to God. We are, instead, pledging allegiance to a republic. The Pledge describes the republic as one nation under God and indivisible. In other words, it is a statement of fact. It is a fact that our Founders established our government on the proposition that freedom comes from God, not the state. As Jefferson, Lincoln, and King attest, the American people's freedom--the freedom of your neighbors, your co-workers, your children, and their teachers, are because we are one nation under God. Take that principle away, remove it from our national consciousness, and we will lose the very basis for the freedoms we so easily take for granted. Lincoln said it well, "Now we are in a great civil war, testing whether that nation, or any nation so conceived and so dedicated can long endure." In this war of ideas, people will not defend what they do not cherish, and they will not cherish what they do not understand. What better way to honor Martin Luther King than to celebrate our religious freedom? Monday, January 16, is Martin Luther King Day. Most schools recognize the day — as they should. But will they teach students about Dr. King’s Christian faith, which motivated and guided his campaign for civil rights? 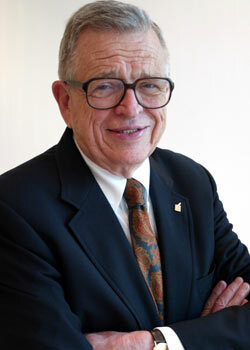 To read more of Chuck Colson's commentary, CLICK HERE.